Foundation, Art Basel Collector's Lounge for Audemars Piguet (Hong Kong, Basel, Miami), 2018. This installation is the final design in a trilogy of lounge concepts by Sebastian Errazuriz alongside new artworks by London-based, Italian visual artist Davide Quayola at Art Basel Hong Kong. Errazuriz’s unique design, based on the natural element of iron ore, will travel to the three Art Basel shows in 2018, a venue where Audemars Piguet has presented innovative concepts in the Collectors Lounge since 2013. Titled Foundations, Errazuriz’s immersive design for 2018 and the finale in his trilogy for Audemars Piguet, is based on iron ore, the natural resource which started it all. 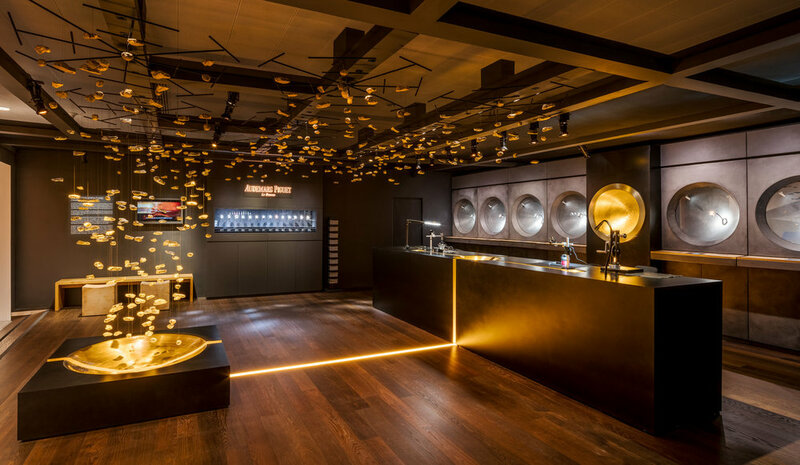 The dynamic installation suspends hundreds of pieces of 3D-printed scanned and hand-moulded rocks from the Vallée de Joux, home of Audemars Piguet in the Swiss Jura Mountains, rotating and moving in perfect synchrony. Evolving from his two previous years’ lounge concepts inspired by two other core natural materials essential to the Vallée de Joux, ice (Ice Cycle, 2016) and wood (Second Nature, 2017), this year’s lounge takes the natural element of iron ore as its point of departure when it became among the principal resources for watchmakers, enabling the craft to thrive.